I have two copies of the 1st edition and have played countless games using these rules. I think they are great. They reward players that know the period they are gaming and know the rules. They are almost infinitely customizable so that you can create the armies and units that you want with very minute or huge differences depending on how weak or strong you want your force to be. They are flexible enough that they work pretty well from 1750ish all the way up to the era of the early machine guns. With minor modifications you can go all the way back to 1690 and even earlier. I actually think they do English Civil War better than Pike and Shotte. They can handle some differences in the nature of the armies, although they do break down at the extremes. The blunder system and random command rolls allow for fog of war and remarkably recreate some of the historical mistakes that are noteworthy in battles. All of that being said, the flexibility of the original set and the tool kit idea behind them makes me wonder why they need a 2nd edition. The philosophy behind the first set was very much "take this and make of it what you want." I will probably buy a copy of the 2nd edition to thumb through. If nothing else they will probably have glorious pictures to inspire gaming and the copy may be fun to read anyway. I don't see any reason to replace what I have or spend the time reading and learning a new, or even updated ruleset. Not that there weren't some problems in Black Powder and I'm open to them fixing those. I will keep an open mind. If the 2nd edition allows me to do Anglo Zulu War as well as the 1st edition allows me to do the Carlist Wars, the Anglo-Sikh Wars and the Crimea I will be a happy camper. Yes, with all the supplements (the ACW one is what I picked up), one would think no second edition was needed. Oh, well, maybe that is how you generate interest in a new set of potential players. And the pictures! Yes. If it includes changes from Pike & Shotte and various rules hidden thru out the various scenario books I will be happy to buy a new version. I wonder if they've developed mechanics for cavalry that aren't ridiculous. That would be a huge improvement, especially for those of us trying to do Napoleonics. I suspect that this edition will incorporate clarifications of all those points that we scratched our heads over. Like Pictors I will probably buy a copy to peruse, if only for the eye candy. I too enjoy Black Powder and will likely buy a new edition! After Pictor's high praise, they are bound to do something that he and others will not be happy about. I have to admit that I have the BP rules but have never played a game (or even seen a game in my area) using them. 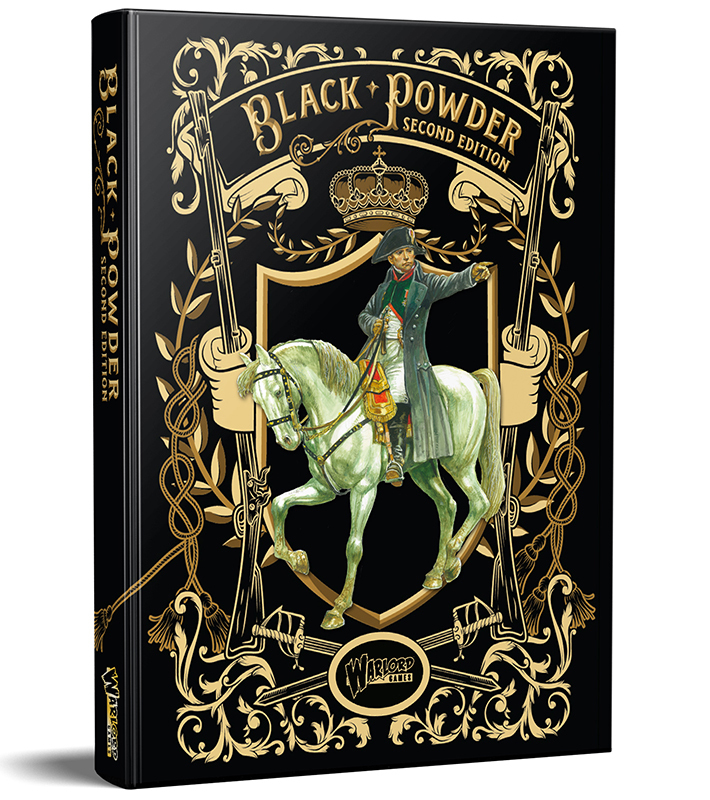 I very much enjoy Black Powder with some mods so I am quite curious to see what they will do with a second edition. I just hope they officially reduce the movement. I hope they don't. The movement is one of the things I like best about the game. Have the rules but only for intelligence research. Odd BP game around here but not a major player…… even at the conventions. Pike and Shotte has a more pronounced convention scene. ditto, movement is very dynamic and the speed accelerate the games. I hope they make the cavalry slightly more useful. Will this mean eventually having to rebuy all the supplement, I wonder? I'd heard it was more of a reorganisation of the rules and a bit of a tidy up, rather than a complete rewrite. I'll probably get v2 at some point…big fan of the rules. Like others here, I'm happy with BP, but will certainly pick up a copy as my current one is rather worn at this point, and hope that it is just some clarifications that are currently available on various forums, but would be nice to have in the rule book. I've never played the original set of rules and bought them for the pictures and to get some Rules ideas. I will definitely buy V2 of BP. I simply like to collect colorful sets of rules. Interesting that this is being re-published – long overdue IMO. I have the "Rebellion!" supplement which, like the "British Grenadier" scenario books, is worth having regardless of which rules you use, but the BP games I've played in have not been satisfactory – having a unit that was on the far side of the table suddenly appear right in front of you and shoot you to pieces because of a single roll of the dice doesn't strike me as particularly historical (and generic sets rarely get the F&IW/AWI/War of 1812 right anyway, because they are atypical in terms of cavalry and artillery).
" having a unit that was on the far side of the table suddenly appear right in front of you and shoot you to pieces because of a single roll of the dice doesn't strike me as particularly historical"
Or game worthy, or fun, or playable. Just strategy ruining gimmick. Worth it if an index and comprehensive rules outline is in an appendix. Rules dispersed throughout the text can be annoying to find. The movement rules aren't a big deal to me. Just use the 2/3 to 1/2 movement rules recommended for smaller tables. There are even adjusted QRS offered for that. An index would be great. It would also be nice if the rules included all of the rules from the supplements, especially the three Napoleonic supplements. BP was written before P+S and HC and it shows a bit. It may be to tighten up and streamline the writing, and I doubt it'll be a big overwrite of the basic rules. I also really doubt the new version will contain the info from the supplements. Why would a Nappy player want all the extra Last Argument of Kings or Glory Hallelujah stuff…..and vice versa? I'd love to see a separate section (or mini rule book) with only the actual rules-leaving the history, narrative, color commentary on sample games and the pictures to the main part of the book. Also, isn't there a rule that limits firing to units that only moved a single bound? If so, the complaint about units suddenly moving from the far side of the board and then firing would seem to be misplaced. The movement and firing rule is amended in Clash of Eagles. No firing if you take more than 1 move. I pre-ordered BPV2 today 2 minutes after it went on sale. Going to use it for ACW. Should be interesting introducing it to my friends. I want to know if it has an index and/or outline form of the rules like Hail Caesar. Other than that I don't think I will bite with just minor rule changes. I tried to play the first edition. It was ok. But there were crucial definitions of troop types/characteristics that were NOT in the table of troop types and characteristics. I had photocopied the vital tables, set up a game, and lo! What I needed could not be found. The troops I needed that for just fought as vanilla. Meh. I found what I needed a half hour after everyone left. Maybe 2nd fixed that, but I have better things to do with my time and money. Don't ask me what it was. It may have been "Warband" or "Fanatic" or something like that. I don't remember and don't care. I sold it off at my next flea market. I'll stick with rules I already know that work and are better organized. What are the 2nd edition rules changes and how do they work ? I saw the article with Rick in WI but doesn't explain in detail. But there were crucial definitions of troop types/characteristics that were NOT in the table of troop types and characteristics……….Don't ask me what it was. It may have been "Warband" or "Fanatic" or something like that. I don't remember and don't care. Without seeming argumentative, I don't know if your memory serves you correctly. There are two places in BP1 where they have tables of troops and suggested characteristics (or special rules as Warlord calls them). One is in Appendix 3 which is lists of Template troops. These are generic standard troop specs to get you started, and Appendix 4 is how to point them out if needed. The other is in the sample games. There are specific lists for AWI in this AAR from pages 110-117. I don't know how you missed the special rules which makes the template troops more than generic. There is a whole chapter dedicated to these special rules/abilities starting on page 88 and going to page 93. It explains all 24 abilities that you can apply to your troops and the cost of doing so. As I wrote above, it seems mostly tidying up of Version 1 rather than a total re-write. My impression is that you and I could play different versions and still have a good game. As for specifics, rockets now deviate randomly instead of just missing. Army General's get a Command re-roll, which was from Hail Caesar. There are also some "special rules" for commanders. As Rick Priestly says in this video, "You can use them if you wish". Also when skirmishers evade away from a formed unit charging them, it doesn't halt the charge. The chargers continue and may hit troops that were behind the skirmish shield. Again, this is from Hail Caesar. I know how this must sound, and I am sorry but I usually cannot play rules written across the pond. Not anyone's fault. It is just a different philosophy about writing rules. I have trouble with rules that are really just suggestions. I know I can modify or have a house rule. I still need the author to commit to a rule. Which will give me a base from which I can modify, delete or whatever. I don't need flexibility in the rules because I already have that flexibility. So write the rule and I will or will not, exercise my flexibility. I do not need a running narrative, history or any other distractions in the rules text. If you want them in the rules that is fine but they need to be in a separate section such as a short history of the conflict or design notes. Units can do some crazy things in these rules. Units marching right past several enemy units to the other side of the table and no one shoots at them as they whiz by. I guess I am not a tool kit kind of player. When I buy a set of rules I actually want the rules already written. I don't need a tool kit. I already have one. The video did nothing to belay my concerns. I am with Winston, I will play what I already know will work. I don't know if you are making generalized comments but these do not apply to BP. Your second sentence accurately describes how BP is written. Not exactly accurate. You can do "passing fire" in this case. (I think that's what it is called, I don't have the book in front of me). I am with Winston, I will play what I already know will work.